Another powerful, Free or paid full featured e-commerce website is ecwid. There is no restriction to the number of items you can have on a free site and you can have as many categories as you want as well. 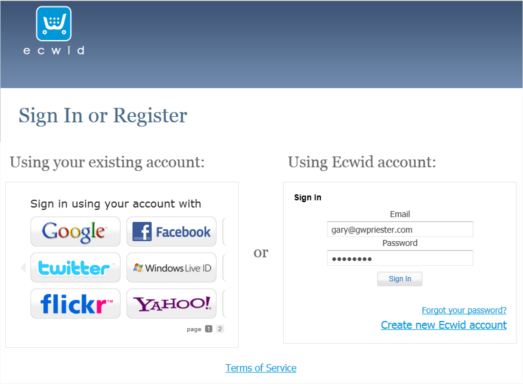 You can sign up for a new account or create an account using any of the accounts shown on the left. I prefer to keep my accounts separate so I signed up for a new account. I signed up on the ecwid website. I was sent a confirming e-mail and after responding to show I was who I said I was, I was sent a store number which I could use to set up my e-store. The generated script creates a store front with a transparent background so it integrates well with your site design. 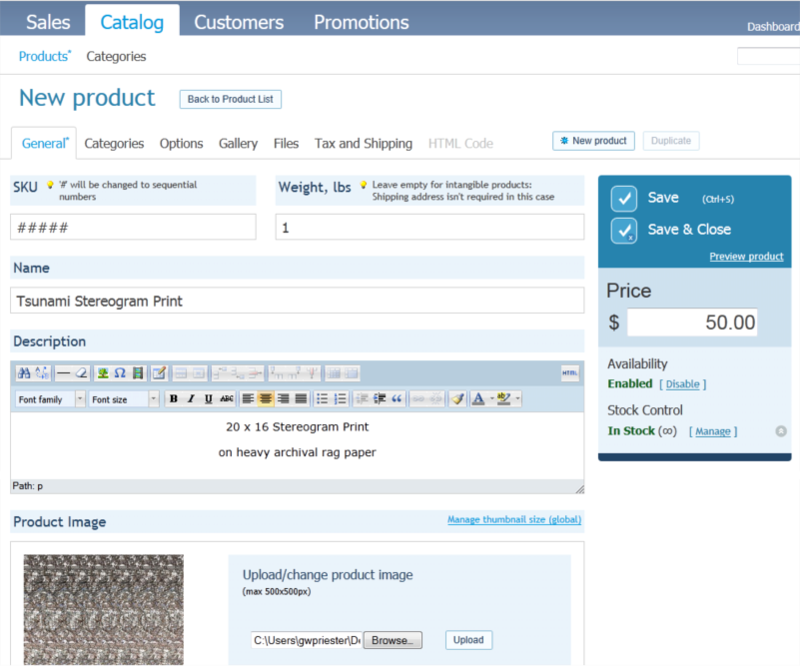 Under the Catalog tab, click Products, then New Product. You can use your own SKU number (Stock Keeping Unit) or leave this blank and ecwid will automatically generate a number for you. Enter the product details including weight (unless it is a download only product), price and availability, title, description, and upload a photo (500 x 500 pixel maximum). If you ship, you must enter a weight. Press Save or Save and Close. You can go back and edit at any time. 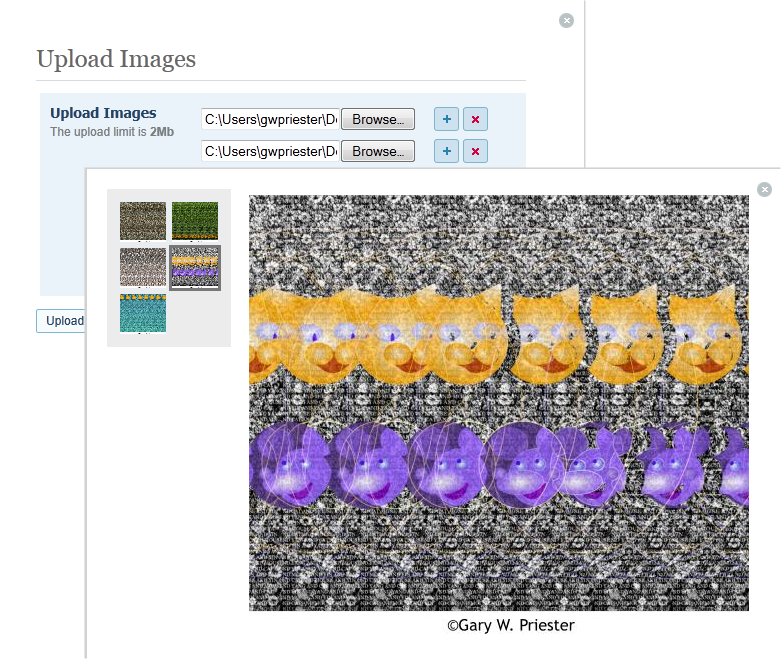 You can create a catalog by uploading your images. The visitor sees the screen shown above on the right above and can click the thumbnail images to see a larger image. You can add a Zone to your store, such as my state, and then charge sales tax for purchases made in your state our add such taxes as are appropriate in your country. When everything is configured, drag the ecwid widget onto the page, enter your Store ID and press Generate, then Insert. Below is my store. I would prefer more control over the layout. And you can do this on the website. If I can remember, the next time I revise this page, I’ll go back and look at the various options. I was in a hurry to get this Workbook published and did not spend as much time with each solution as perhaps I should have. I altered the placeholder code for the store and reduce the Width setting to 80% to fit on the page. If you have any questions or problems, ecwid has a very excellent Web- based forum staffed by friendly and knowledgeable persons. In many cases there was a response to my questions almost in real time. Good product and good people.